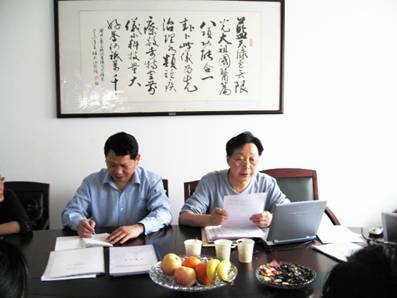 From the website: The two-day-long verification of "international quality management system certification" for the bluelight company would be concluded successfully on April 21, 2007, which signifies that the company has passed the verification and will receive the certification of quality management system. At 4 p.m. on the 21st, the second meeting of "international quality management system certification" was opened in the Bluelight Company, The senior auditors Jia zhendong and Wei Rushi from Beijing Huaguang Medical Apparatus Authentication Company gave a summary report for the verification work carried on in the passed two days and made some useful suggestions and requests. 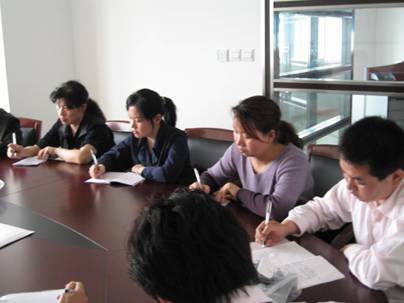 Mr. Luo expressed special thanks for the experts who have come to the company for the verification, and he would positively adopt the demands and recommendations offered by the experts to improve and perfect the management system of the company, and he would implement the Bluelight's policy of quality to the end-"safe, effective, quality-oriented, sincere service, user satisfaction". Finally, the second conference was finished successfully in a burst of warm applause. Till now, the Bluelight Company has got CE Attestation of Conformity in EU and the quality management system certification that has completed the connection with the international economy in the management. The Bluelight Company will face the challenges of the international market with higher quality products and services. The future of Bluelight will be brighter and brighter!